Credit for this article on NAFTA Renegotiations is given to Britton Clarke of the Border Trade Alliance in Washington, D.C. Representatives from the US, Canada and Mexico gathered in Washington on Wednesday-Sunday for the first round of NAFTA renegotiations. “But for countless Americans, this agreement has failed. “We cannot ignore the huge trade deficits, the lost manufacturing jobs, the businesses that have closed or moved because of incentives — intended or not — in the current agreement. The full USTR statement is here. Mexico’s statement was delivered Minister of the Economy Ildefonso Guajardo. Before the negotiations got underway, BTA attended a meeting of the Mexico Institute at the Woodrow Wilson Center. Panelists discussed both procedural and substantive aspects of the renegotiations. Regarding the procedural points made, the negotiators plan to meet seven times by the end of the year. Each session is expected to take five days. The goal is to finish NAFTA renegotiations by the end of the year. It is anticipated that the negotiations, although trilateral, will have a strong emphasis on trade between the US and Mexico. Following the conference, the Wilson Center held an invitation only roundtable. We had a seat at the table. 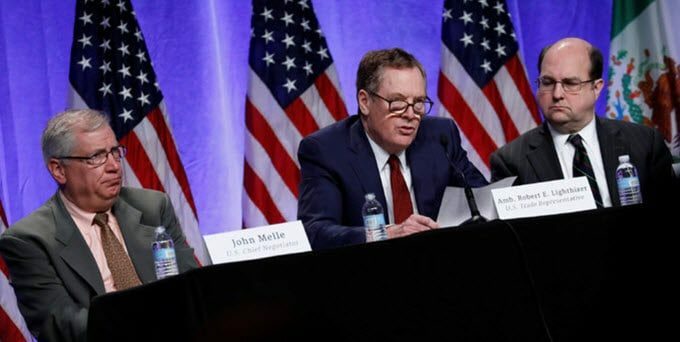 One of the main themes of the roundtable was that there is a perception that Members of Congress, who will likely have to approve the trade agreement if it is comprehensive as indicated, are unaware of the beneficial impact NAFTA has contributed to the US. economy. Specifically, there was a perception that non-border state delegations do not appreciate the impact to their home states and constituents. However, we and others at the table emphasized that efforts to educate non-border state delegations have reaped benefits. But all agreed that we have work to do going forward to educate Capitol Hill on the benefits of NAFTA. As a side note, Ambassador Wayne again acknowledged BTA for our USTR comments (mentioned here in this Union-Tribune column he authored). We have heard from other stakeholders that the BTA’s USTR comments were “spot on,” and we have been encouraged to keep up the good work. BTA member Werner Enterprise’s President and CEO, Derek Leathers, did a live TV interview on CNBC that focused on NAFTA and its importance to the US economy. We provided Derek with talking points prior to the interview, several of which he was able to incorporate into his statements into the limited time available during the interview. A “Thank You” to Derek for carrying the Pro NAFTA banner. Many thanks to Sam Vale who stepped in to do a TV interview with China Global TV regarding the start of negotiations on Global Business. Sam discussed what Mexico is looking to get from the negotiations and how it should approach the US administration’s first trade negotiation. Our friend Maria Luisa Boyce at UPS is conducting a free Spanish-language webinar on NAFTA and other trade agreements’ impact on business on Aug. 30. The session will feature special guest Sergio Garcia Gomez of the Mexico’s Secretary of the Economy office at the Mexican Embassy in Washington. I’ve attached more information, but you can register here. make timely decisions with the goal of completing all Federal environmental reviews and authorization decisions for major infrastructure projects within 2 years.